The solder mask means the green part on the printed circuit board. In fact, it uses the negative output, so when the shape of the solder mask layer is mapped to the PCB board, it is not the green oil , but the copper skin is exposed. The solder mask is mainly Liquid UV Photo-imageable Ink with green, red, blue, yellow, white, black and purple colors, green should be the most commonly used one. And according to those colors available, there are some points in our production for your reference. l the cost for green, blue, red, blue, yellow, white and black are the same without extra charge, and extra charge needed for purple, matte green, matte black mask. 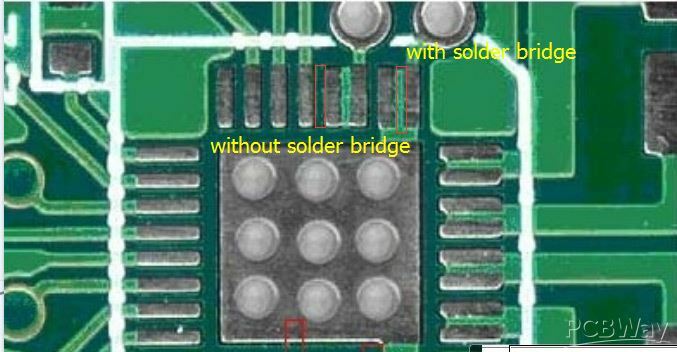 The solder bridge is the green oil between the two pads or the IC pins, For its narrow need, so it is called the solder resist bridge. If the distance between the pins is too small to meet the factory process, it will be recommended to cancel it and proceeded with full mask openings. Mask opening: any area without mask printing can be called window opening, it includes areas for solder PAD, paste PAD, trenching, etc.